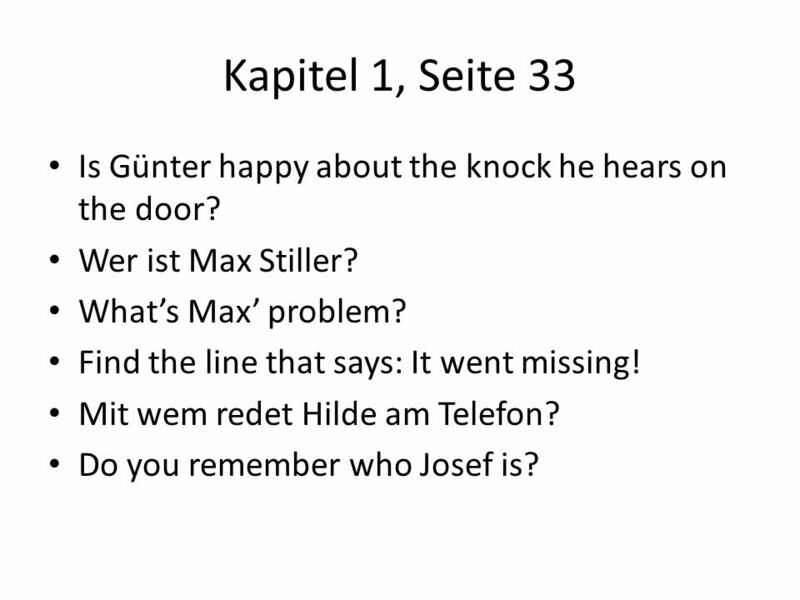 2 Kapitel 1, Seite 33 Is Günter happy about the knock he hears on the door? Wer ist Max Stiller? What’s Max’ problem? Find the line that says: It went missing! Mit wem redet Hilde am Telefon? Do you remember who Josef is? 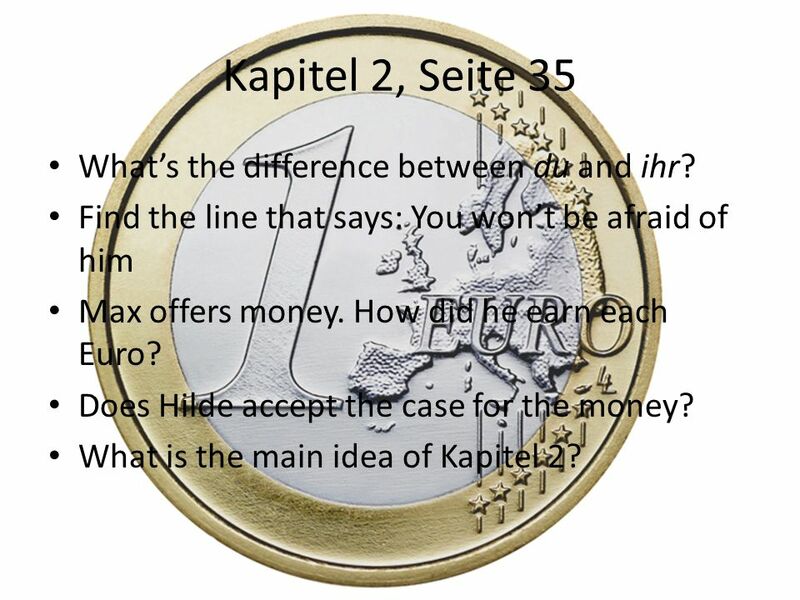 3 Kapitel 1, Seite 33-34 How would you translate Hilde’s sentence: “Das geht dich nichts an.” So what’s your opinion? Is Josef too old for Hilde? Do you think Günter is really concerned about his sister’s well-being? Why does Günter try to talk with his hands over his mouth? 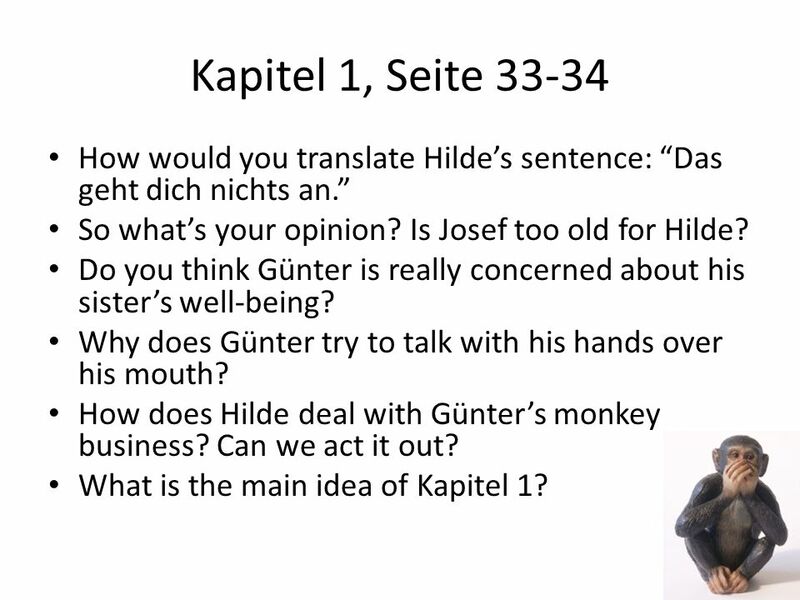 How does Hilde deal with Günter’s monkey business? Can we act it out? What is the main idea of Kapitel 1? 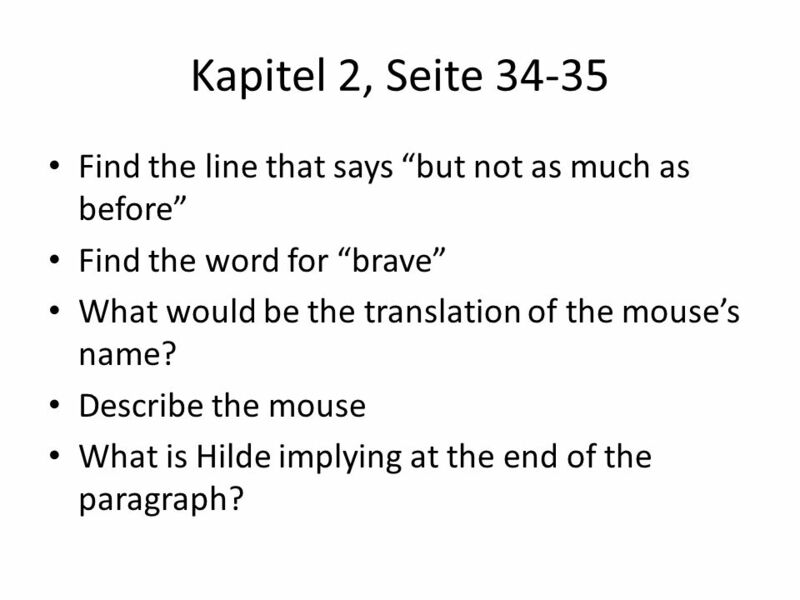 4 Kapitel 2, Seite 34-35 Find the line that says “but not as much as before” Find the word for “brave” What would be the translation of the mouse’s name? 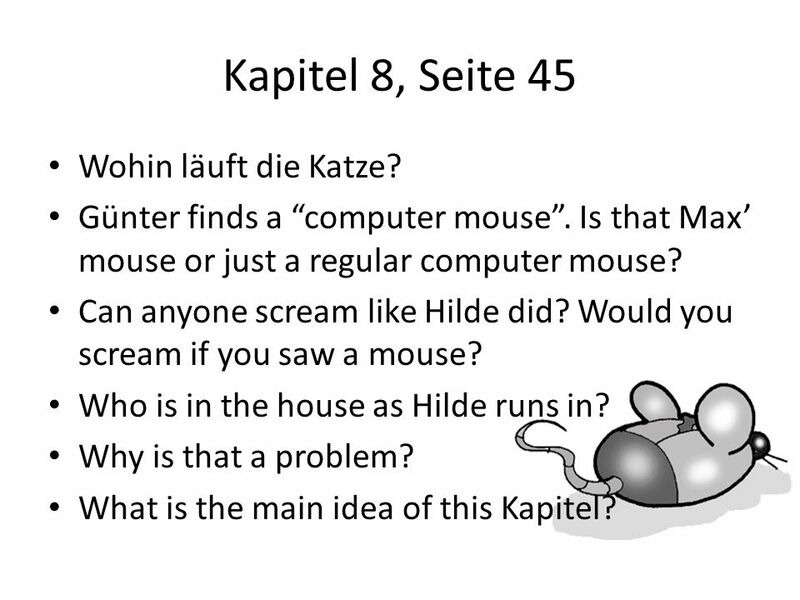 Describe the mouse What is Hilde implying at the end of the paragraph? 5 Kapitel 2, Seite 35 What’s the difference between du and ihr? Find the line that says: You won’t be afraid of him Max offers money. How did he earn each Euro? Does Hilde accept the case for the money? What is the main idea of Kapitel 2? 6 Kapitel 3, Seite 36 What’s the German word for “front door”? 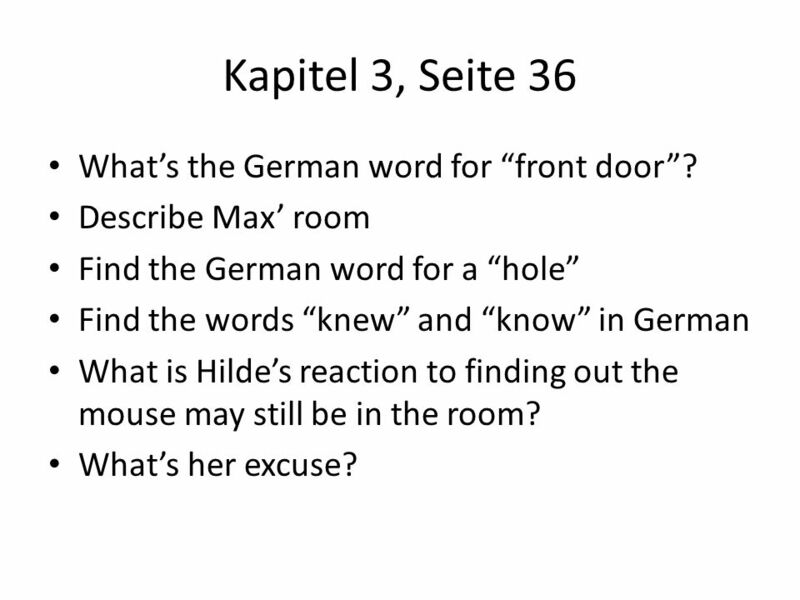 Describe Max’ room Find the German word for a “hole” Find the words “knew” and “know” in German What is Hilde’s reaction to finding out the mouse may still be in the room? What’s her excuse? 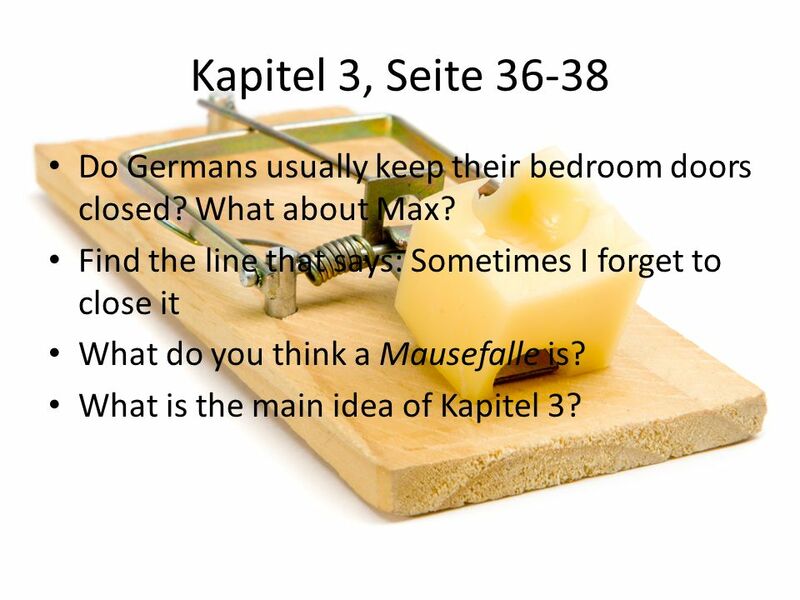 7 Kapitel 3, Seite 36-38 Do Germans usually keep their bedroom doors closed? What about Max? Find the line that says: Sometimes I forget to close it What do you think a Mausefalle is? What is the main idea of Kapitel 3? 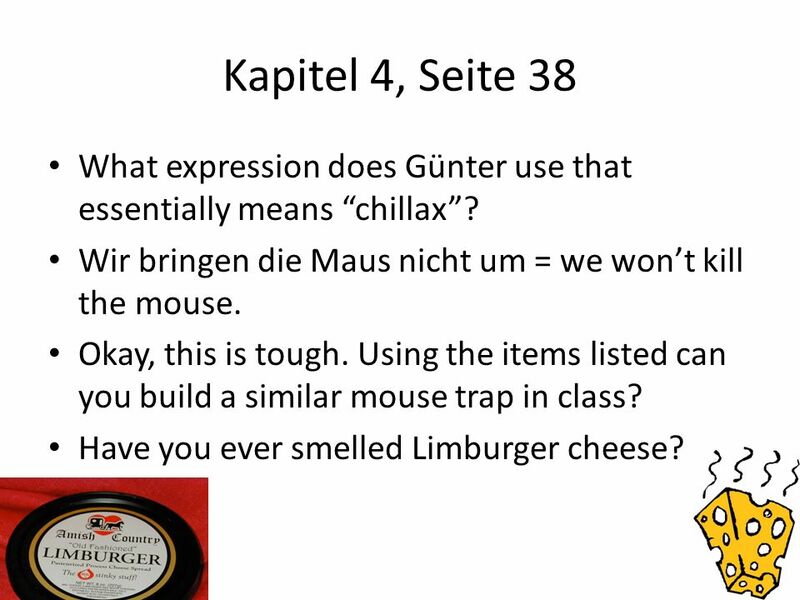 8 Kapitel 4, Seite 38 What expression does Günter use that essentially means “chillax”? Wir bringen die Maus nicht um = we won’t kill the mouse. Okay, this is tough. Using the items listed can you build a similar mouse trap in class? Have you ever smelled Limburger cheese? 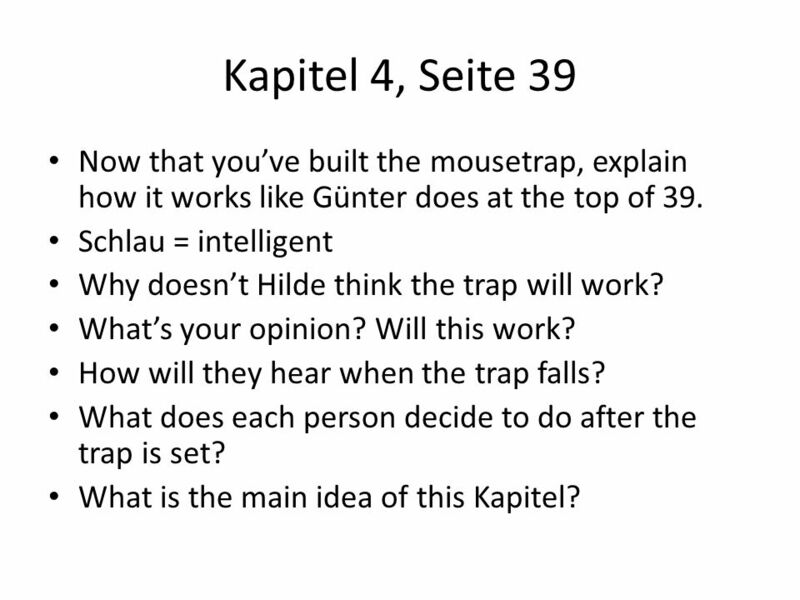 9 Kapitel 4, Seite 39 Now that you’ve built the mousetrap, explain how it works like Günter does at the top of 39. Schlau = intelligent Why doesn’t Hilde think the trap will work? What’s your opinion? Will this work? How will they hear when the trap falls? What does each person decide to do after the trap is set? What is the main idea of this Kapitel? 10 Kapitel 5, Seite 40 Warum gehen sie in die Küche? Can anyone act out Hilde’s part in the kitchen? Sieht Günter die Maus in dem Kühlschrank? 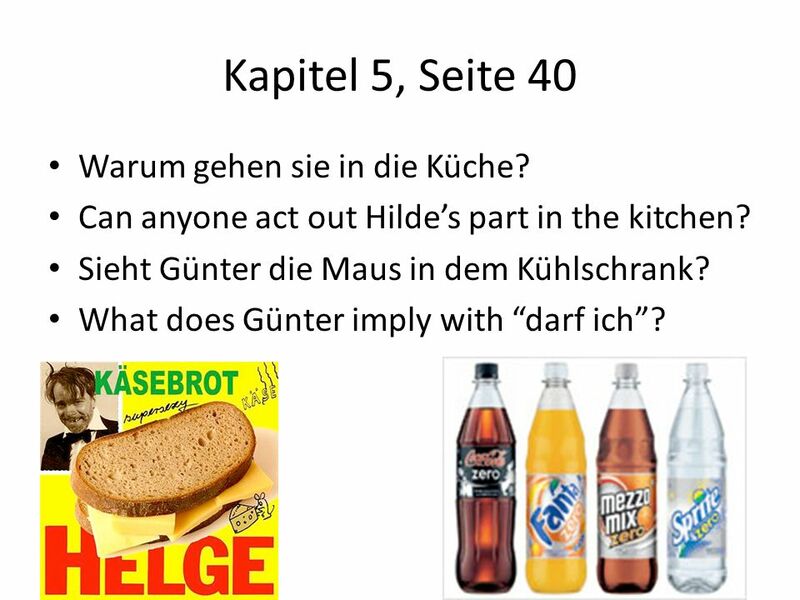 What does Günter imply with “darf ich”? 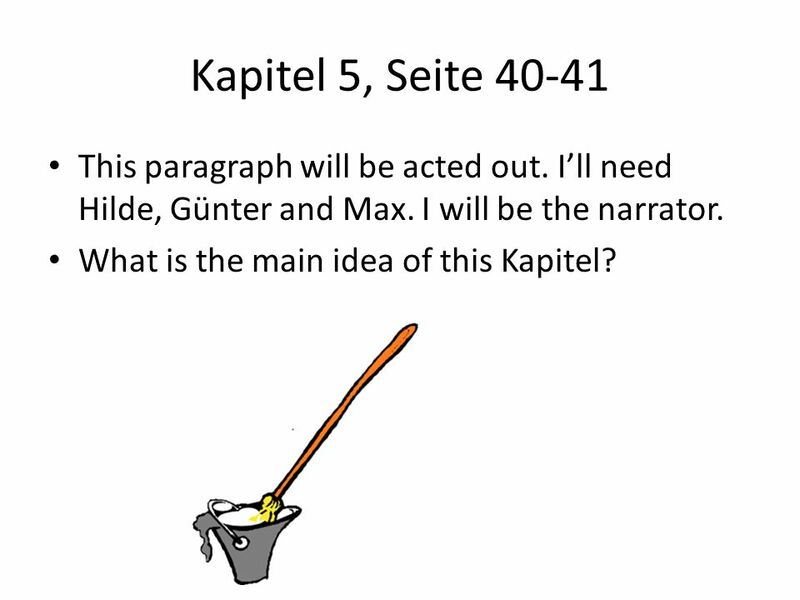 11 Kapitel 5, Seite 40-41 This paragraph will be acted out. I’ll need Hilde, Günter and Max. I will be the narrator. What is the main idea of this Kapitel? 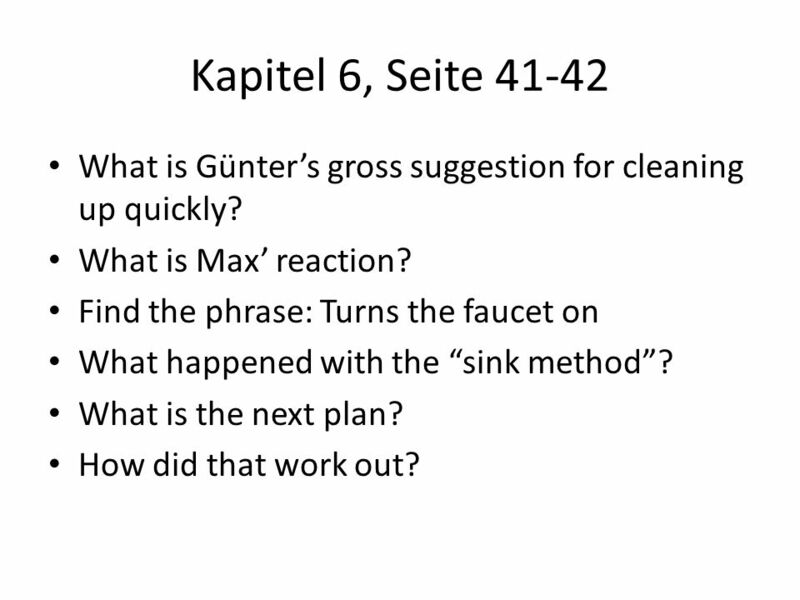 12 Kapitel 6, Seite 41-42 What is Günter’s gross suggestion for cleaning up quickly? What is Max’ reaction? Find the phrase: Turns the faucet on What happened with the “sink method”? What is the next plan? How did that work out? 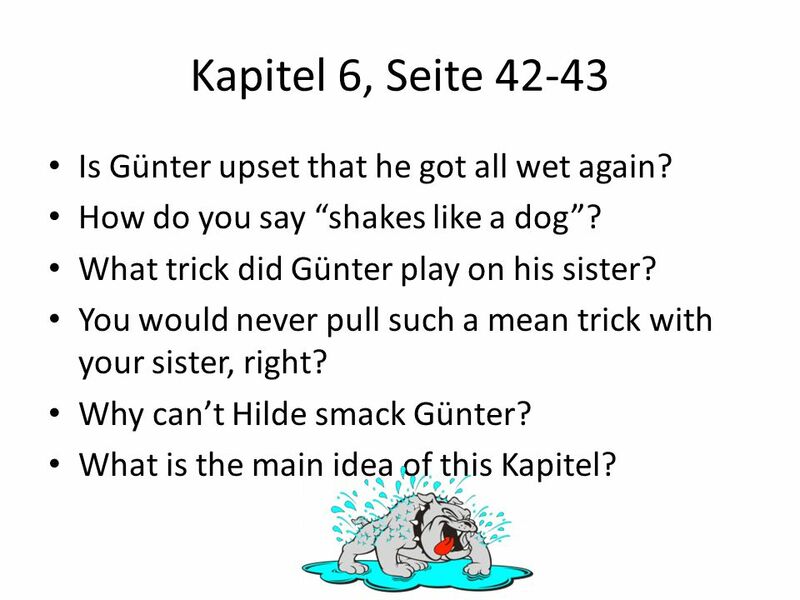 13 Kapitel 6, Seite 42-43 Is Günter upset that he got all wet again? How do you say “shakes like a dog”? What trick did Günter play on his sister? You would never pull such a mean trick with your sister, right? 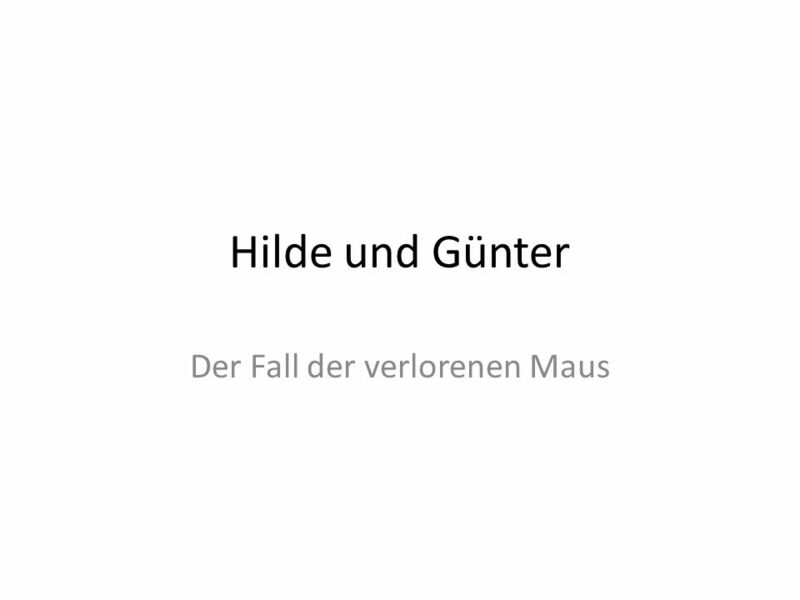 Why can’t Hilde smack Günter? What is the main idea of this Kapitel? Why doesn’t Günter help clean up the bathroom? How are they going to deal with these wet clothes? What does the euer mean in “Steckt euer Kleider in den Trockner”? How long will it take to dry? 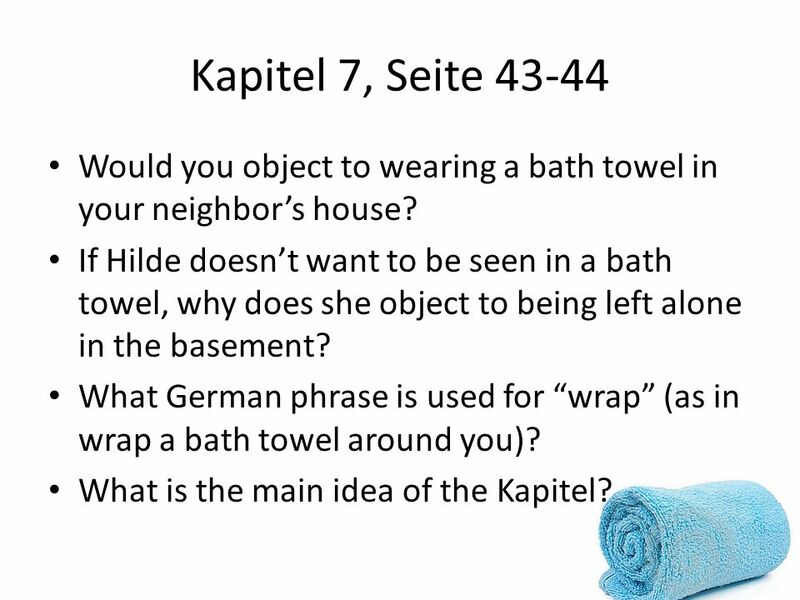 15 Kapitel 7, Seite 43-44 Would you object to wearing a bath towel in your neighbor’s house? If Hilde doesn’t want to be seen in a bath towel, why does she object to being left alone in the basement? What German phrase is used for “wrap” (as in wrap a bath towel around you)? What is the main idea of the Kapitel? 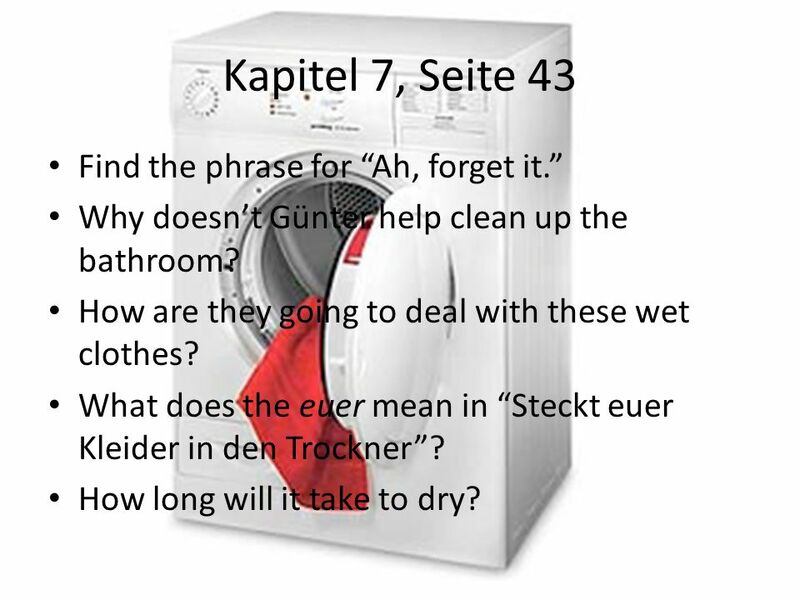 16 Kapitel 8, Seite 44-45 Find the phrase for “she forgets to turn the dryer on” Did they catch the mouse? What happened? Do you think Max is a responsible mouse owner? What mistakes does he make? Is Günter really a cat whisperer? What does “hast du die Maus gefressen” mean? 17 Kapitel 8, Seite 45 Wohin läuft die Katze? Günter finds a “computer mouse”. Is that Max’ mouse or just a regular computer mouse? Can anyone scream like Hilde did? Would you scream if you saw a mouse? Who is in the house as Hilde runs in? Why is that a problem? What is the main idea of this Kapitel? 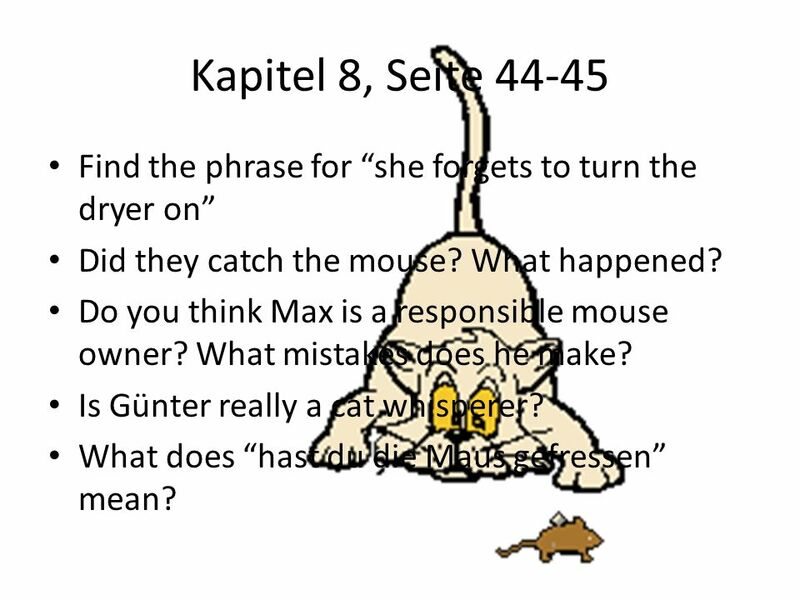 Download ppt "Der Fall der verlorenen Maus"
Reading Part Released Test 22. In paragraph 5, the word discriminating means A. A. believing statements B. B. remembering events C. C. judging. Die Frage des Tages: 1. Take out your study guides, any questions? 2. Take a crossword from the front of the room and get started! Klevans2011 Idioms 3 rd - 5th. klevans2011 Idioms An idiom is a phrase that has a special meaning different from the actual meaning of the words. Sight Words List 1 Mr. Matthews Grade One can.